BOTTOM LINE: A creative weaving of a traditional story with modern music that truly succeeds in showing that tradition does not have an expiration date. Choker Bali takes on the daring task of bringing traditional Indian customs together with modern culture and female sexuality, through the medium of Greek tragedy. A chorus sits on stage clad in white, singing modern songs and weaving a tale meant to teach audiences a lesson about desire. This chorus, vocally led by the awe-inspiring Classical Indian singer Kritika Dey, and accompanied on guitar by Karim (Jack Quint) serves as a comment on, and the introduction for, the action to come. After a traditional opening number, the story unfolds. Hardworking mother Rajlakshmi (Maryan Newbury) is anxiously waiting for her spoiled but well-meaning son Mahendra (Matthew Provenza) to find a suitable wife. He takes a "common girl," Ashalata (Radhika Mehrota), much to the disdain of his mother and the chorus. Mehrota, who wins the audience over with her charm, and Provenza have excellent chemistry and comic timing, and their scenes “studying” together, as Mahendra attempts to teach his new wife all of the things he learns in school, could bring a smile to anyone’s face. Their innocent love changes for good the day that tutor and renowned widow Binodini (Sarah Suzuki) comes into the house in order to educate Ashalata. The two women become fast friends, with Ashalata nicknaming Binodini choker bali meaning “sand in my eye." Binodini’s intriguing edge, well-crafted by Suzuki, differs starkly from Ashalata’s pure innocence and love. The chorus similarly feels the insecurity of the situation. When Mehrota walks in on Ashalata and Binodini singing a charming rendition of “Me and Julio down by the Schoolyard” the curious look in his eyes propels the story forward into the forbidden love triangle that is so common in the classics. Binodini, Ashalata, Mehrota, and Rajlakshmi grow further and further apart as Mehrota acts increasingly unpredictable, tortured by love. Each character gets a spectacular solo moment of vulnerability that shows the deep pain common to all members of this love triangle, giving new life to this popular storyline. 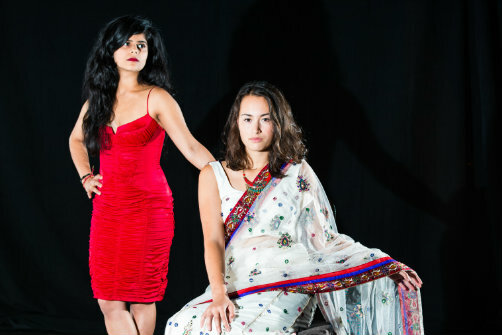 From here the tragedy unfolds with more commentary by the Greek chorus, alternating between spoken dialogue, traditional Indian songs, and modern acoustic pop hits. Choker Bali makes one think about the meaning of love, obsession, and longing—and perhaps about the need to analyze which feelings are worth following, and which should be left alone. Choker Bali is by Dr. Partho Chatterjee, based on a book by Rabindranath Tagore. Directed by Arpita Mukherjee. Choreography is by Rujuta Vaidya. Lighting Design is by Christina Tang. Technical Director is Kyle Rosenberg. Assistant Director is Holly Payne-Strange. Music Director is Jack Quint. The cast is Alisha Desai, Vaibhav Jain, Eliza Madrone, Radhika Mehrohtra, Maryan Newbury, Matthew Provenza, Jack Quint, Rita Suri, and Sarah Suzuki (blue cast) and Kabir Chopra, Morgan DeTogne, Gautam Gurnani, Gerrard Lobo, Shubhra Prakash, Jack Quint, Richa Rudola, Mahima Saigal, Monique Sanchez, and Zenobia Shroff (green cast).